I've been interested in the US presidency for some years, and I've been fascinated by the Kennedy family for even longer. So this book, written by Jackie Kennedy’s Secret Service agent (along with Lisa McCubbin) about the three years that he spent in her company, was something I wanted to read as soon as I found out about its existence. Even though you probably don’t know it, you have probably seen Clint Hill before. If you have ever seen the shocking footage of John F. Kennedy’s assassination, Hill is the agent on the back of the car, reaching across to Jackie Kennedy as she scrambles across the boot. That should give you some idea of the proximity of this man to the First Family, and therefore how qualified he is to write a book about them. The story of the Kennedys is so familiar, and it has been told in a myriad of ways. Even if you don’t take an interest in them as I do, you will probably have heard about JFK’s health problems, his affairs, and the family’s dubious connections. Hill’s memoir doesn’t touch on those things, choosing instead to concentrate on what he saw and experienced alongside the First Lady. Hill talks about his disappointment at being assigned to the detail to protect Jackie Kennedy, rather than the president. He had worked on the President Eisenhower’s detail in the previous administration, and he saw that as the exciting, privileged job. At first he resented being stuck with the First Lady, imagining that it would be all tea parties and fashion shows. It didn't take him long to realise how wrong he was. His life alongside the First Lady was exciting and cosmopolitan and allowed him to travel to places he would never have dreamt of. 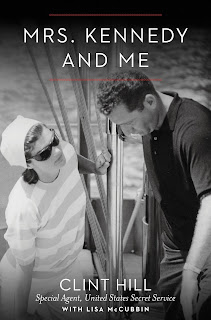 The way he writes about Mrs Kennedy makes you realise how fond he became of her. I found myself feeling quite sorry for his rarely-mentioned wife; he spent long periods of time away her, as the First Lady went all over the country, and all over the world, reluctant as she was to spend much time at all in the White House. Imagine being married to a man who not only spends the majority of his time with a beautiful, cultured woman, but who also obviously idolises her. And that sets the tone of this book. It is almost reverential; as I mentioned, Clint Hill obviously became very fond of Jackie Kennedy. His job dictated that he would lay down his life for her, but it becomes clear that he would have done whatever it took to make her life easier, because of the esteem in which he held her. Almost any book about JFK builds to a crescendo with the events of 22nd November 1963. Throughout the book, you know that it is coming, and as it approached, my heart began to beat a little faster. It never becomes any less shocking that a man had his head blown apart as he rode in a car next to his wife. Reading about it, and the aftermath, from a man who was so close to the action is heartbreaking, but definitely worth reading. I would definitely recommend this to anyone who is interested in the Kennedys; Clint Hill is able to write from a very personal perspective. Even if you are not particularly enthralled by the family, you may still find that you enjoy it, because it provides a unique insight into a very specific set of circumstances.